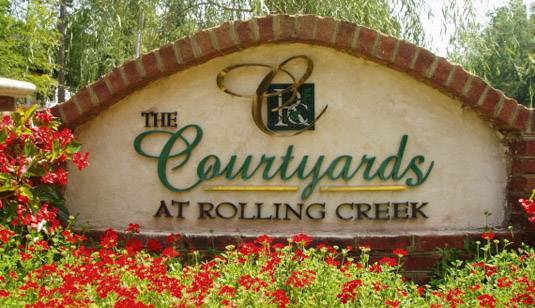 Courtyards at Rolling Creek is an upscale patio/garden home community located in Irmo SC. This neighorhood has a great location, only minutes to shopping, restaurants, and entertainment located on Harbison Blvd. and 20 minutes to downtown Columbia. Convenient access to interstate I-26 make traveling easy and Columbia SC airport is only 25 minutes away. Lake Murray is only about 5-10 minutes away and offers lots of on the water recreation for Irmo SC residents. Courtyards at Rolling Creek features nature and hiking trails, recreational areas, and a pool and cabana. This neighborhood is currently zoned for Lexington/Richland District 5 schools. Homes in this neighborhood range in price from the mid 200's to the low 300's. There are a variety of home plans to choose from and some resale opportunities in the neighborhood as well. Homes range in size from approximately 2200 square feet and up.